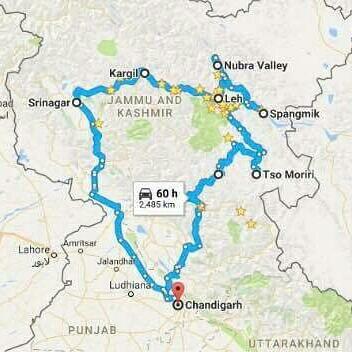 Mode of Journey Planned: Bangalore to Delhi by flight, Delhi to Chandigarh by train and ride from Chandigarh. Bikes: TVS Apache 160 and 180, Hero Karizma, RE Thunderbird500, RE Thunderbird350, 2 of RE Desert Storm, Honda CBR150 and Suzuki Gixxer. 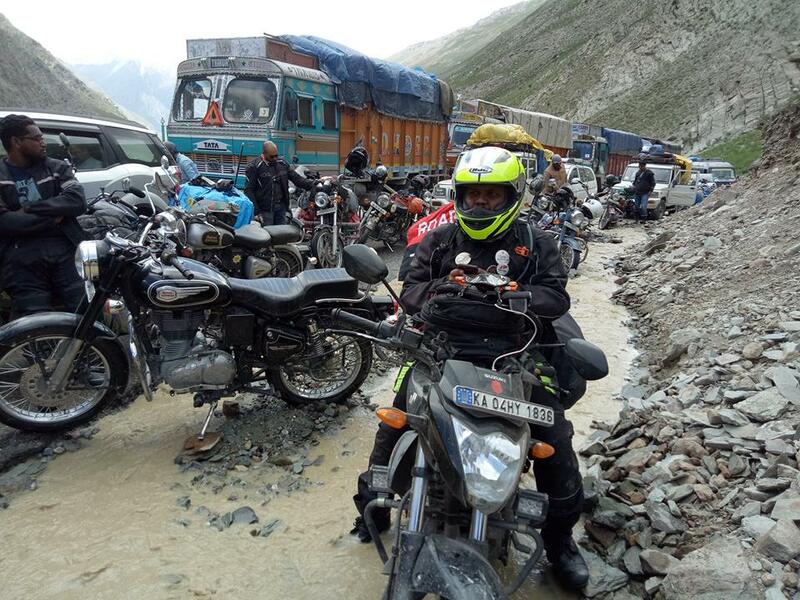 Leh Ladakh Bike Trip, an adventurous trip that all biker’s dream, I grew up watching those Himalayan rallies which telecasted back those days on TV. It was my dream too. 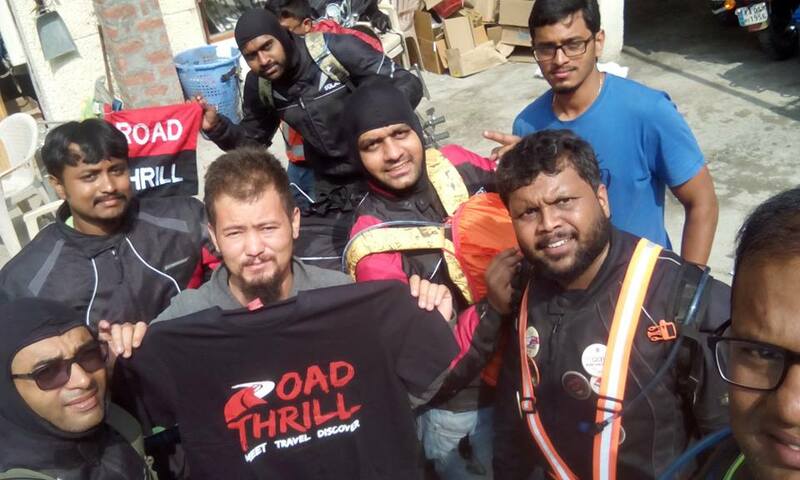 It was in the month December 2016 when Rajesh and Phani agreed for the Dream Ride, followed by Satish Bhai, Karthik, Deb Bhai, Gowda, Harish Bhai and Karthik Vadhri (K2), all from Road Thrill. We got our flight tickets booked as par with the train schedule to cargo our bikes to Chandigarh. Planning the itinerary was a challenge. Rajesh and I spent a hell lot of time in getting the itinerary in place. 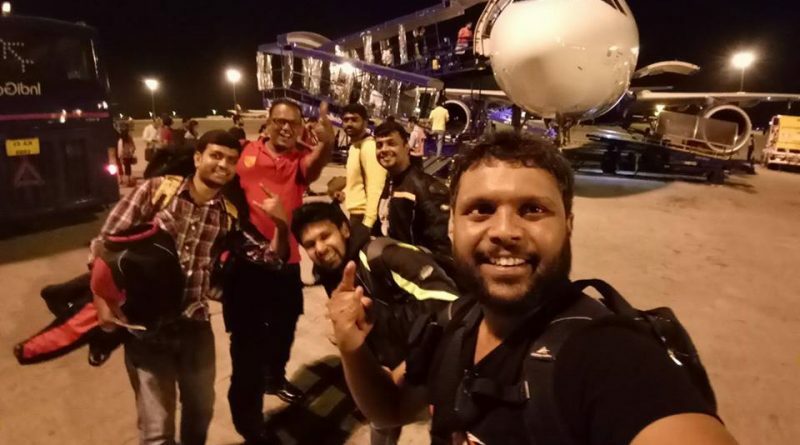 Many of my friends from Road Thrill, Gixxer Club Bengaluru and few others helped me a lot for the itinerary. 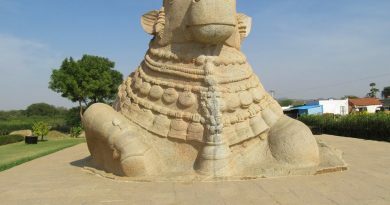 It started as a crazy impractical plan and post discussing with few experienced people, we came with the final itinerary. 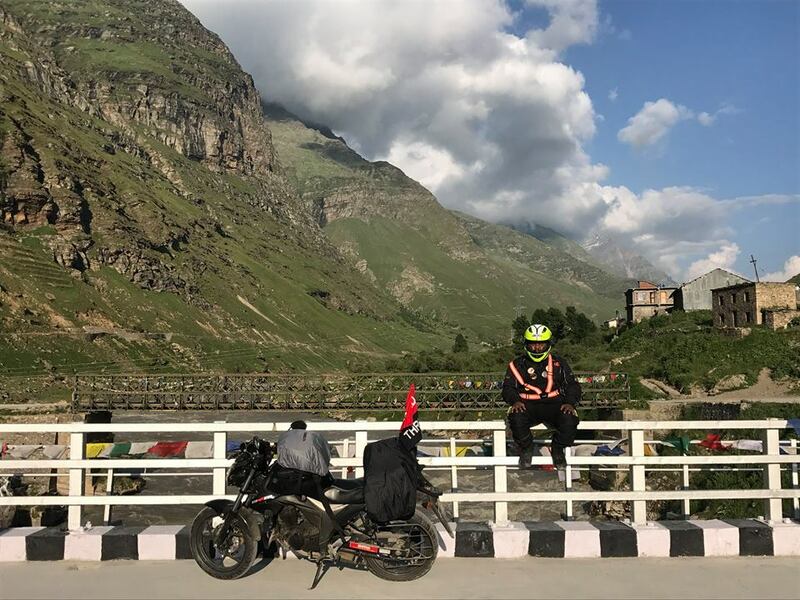 The initial plan for thie Leh Ladakh Bike Trip was to enter via Srinagar and exit via Manali, but finally we sticked with the other way round that was entering via Manali and exit via Srinagar. Every one of us got busy with all the shopping of bike accessories, riding gears, action cameras and the list went long. 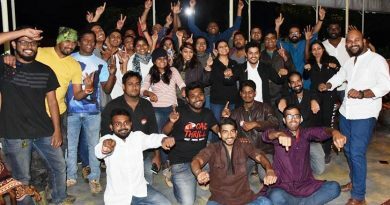 Decathlon, Lets Gear Up, Orion Motors, NH4 showroom, JC Road became our new meet-up hubs. The bond of biking brotherhood between the team grew quickly, and pulling each other’s legs on whtsapp group or during our meetups. Every one of us was literally waiting for the big day. 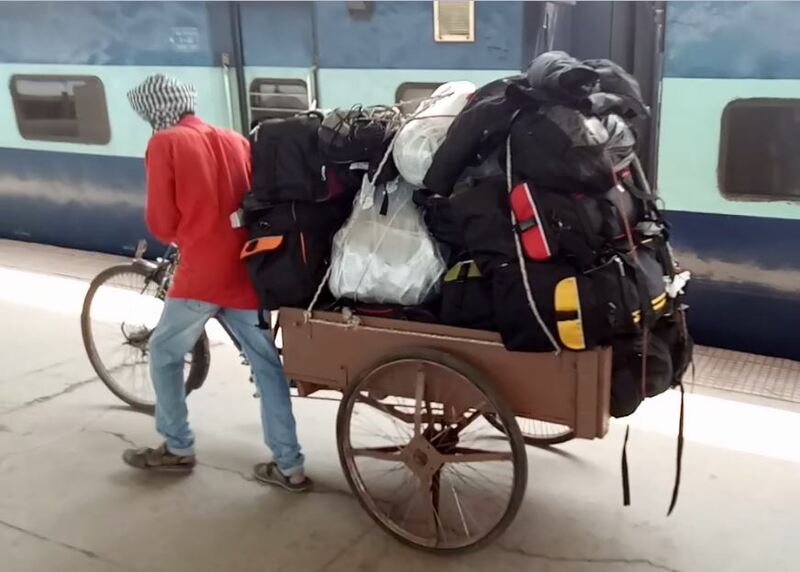 After enquiring about the various cargo options to ship our bikes to Chandigarh, we finalized with the Indian Railways as that was the cheapest and the quickest mode available. Meanwhile, I was working parallel on the Inner Line Permits. Thanks a lot DK Pandit Sir from the forum “Ladakh Returns” on FB, got a lead for Inner Line Permits, his name was Rigzin Angdu (Rigzin Bhai). I quickly got in touch with him and provided all our necessary details that required in obtaining the Permits. Rigzin bhai got us Inner Line permits well in advance and had it couriered to me. Thanks a lot Rigzin Bhai. 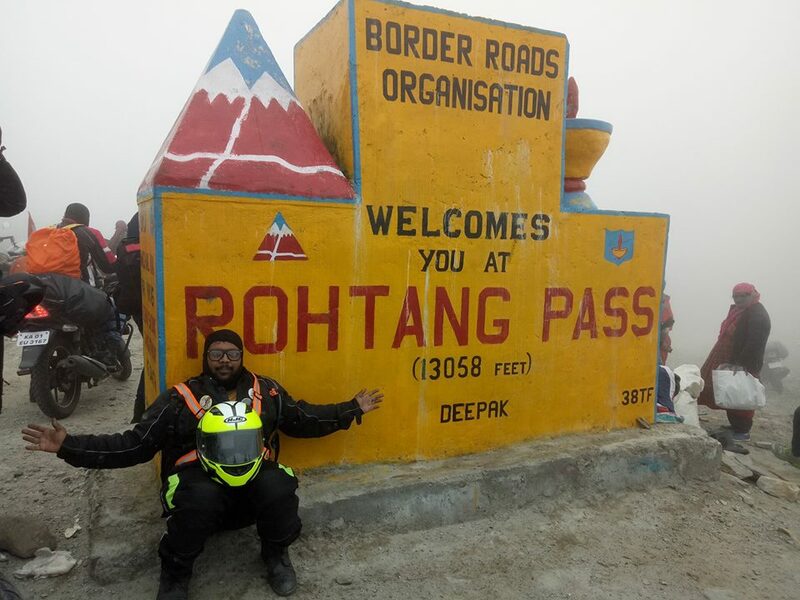 Satish Bhai took care of Beyond Rohtang Permits and we all had the necessary permits that required for the Leh Ladakh Bike Trip even before we all departed from Bangalore. 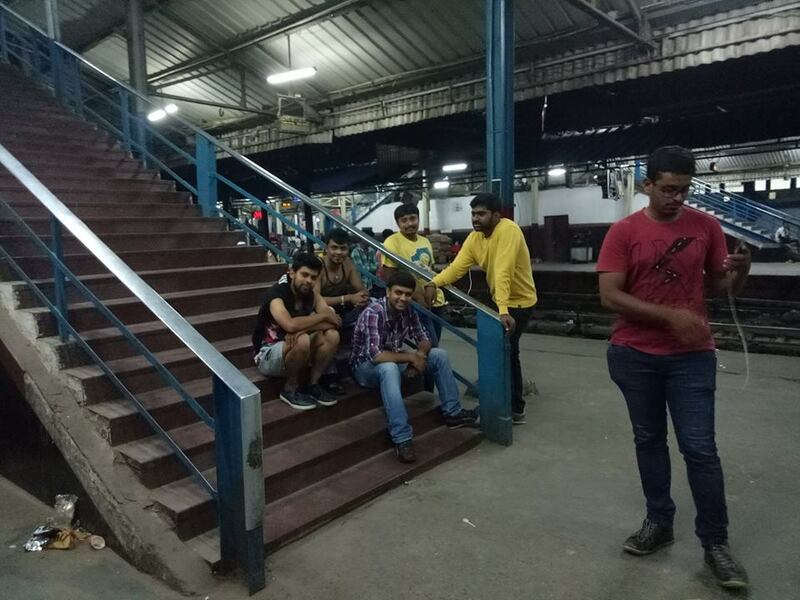 We dropped our bikes in Yeshvantpur railways station on 04th of July 2017, a day in advance from the train’s departure. This train, Samparkranti Express departs every Wednesday from Bangalore and reaches Chandigarh on Friday. Many thanks to Phani, who got the railway cargo in place. I rented a moped from Royal Brothers Bike Rentals for my convenience to commute in Bangalore. Rajesh and I were riding through Old Madras road, I lost my phone, as it fell from the jacket pocket. I lost my phone 2 days prior to our departure. I arranged for a basic phone until I took a new phone. 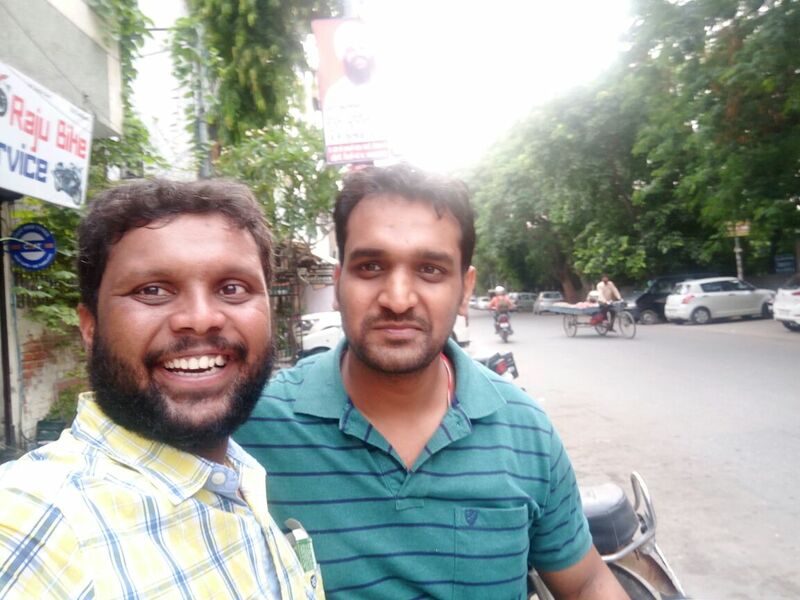 But, next day I got a call, he said he got my phone near to RMZ Infinity on Old Madras road and asked me to come to Indira Nagar and collect it from him. As I reached Indira Nagar and got ourselves introduced, his name was Ashwath Bhat. Ashwath: Let me show you the phone! Me: Once I saw my phone, its display was totally shattered as the phone had fallen on the road; I asked how you found my contact from this broken phone? He called the Jio customer care number, told them about the lost and found phone, told them the sim number and obtained my alternate contact number from them and called me stating he found my phone. I was stunned by his efforts to contact me and hand over my phone to me. However, I had to buy a new smart phone before I depart to Leh. All our packing was done a day advance. As the day of our departure arrived, the excitement was like the adrenaline mad rush pumping through our blood. The adventure was all about to begin . . . . .
We were eagerly waiting to check-in to Bengaluru International Airport and board our flight to Delhi. None of us had the mood at our work places. The mountains and those terrains were the only thing being visualized in our minds. We all decided to reach the airport by 6.00pm but due to heavy rains that poured that evening, we all made to the airport by 7.30pm. Our flights were at different departure times. 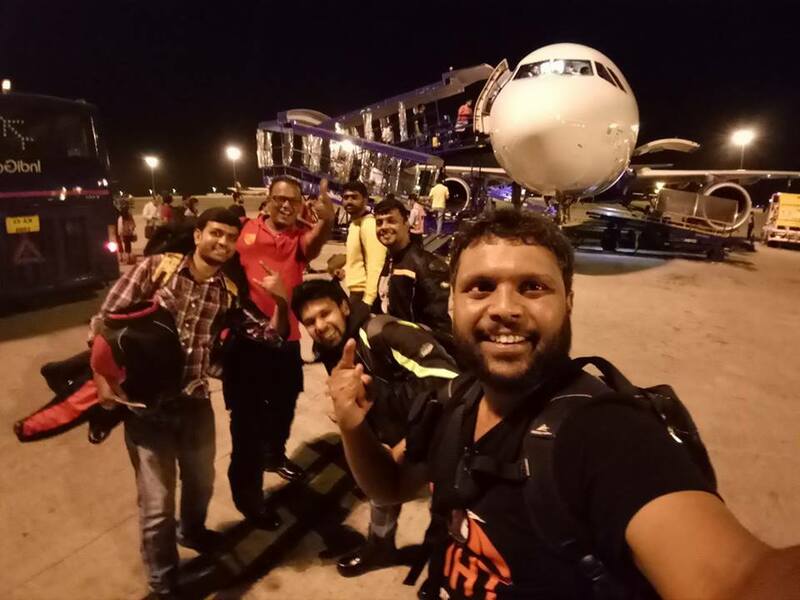 Karthik and K2 had their flights at 9pm and the rest of the pack had our flights at 10pm. As Satish Bhai works in Indian Army and was posted Chandigarh and he would join us at Bilaspur as he was busy with training. We all went through the Airport security checks, baggage were also checked-in. Apart from both the Karthik’s, our flight was delayed by an hour. Karthik and K2 were waiting for us at Delhi. As soon as the rest of us landed at Delhi Airport, we quickly booked a cab to Old Delhi Railway Station. We had our train tickets booked to Chandigarh which had to depart from Delhi at 4.25am, but the train was running 1.5 hours behind schedule. We all eagerly waited for the train to arrive. We boarded the train post its arrival at 6.00am and decided to take a nap for 4-5 hours until we reached Chandigarh. It was 11.00am when we reached Chandigarh. We hired a porter to carry our baggage. Now, the first question everyone had where is our bikes? Post enquiring in the Railways Parcel office, we got to know where our bikes were parked. Every bike that was packed, we checked on the number plates to identify it. Finally we sighted our bikes, the adrenaline pumped up as we all started unpacking our bikes. But we had few setbacks. Our bikes were damaged in transit. K2 had his bike’s number plate detached, few dents on Harish Bhai’s “Toruk Moktu” (this is what Harish bhai has named his bike) and the front brake lever was broken on Phani’s “Beast”. Satish Bhai had booked Army Guest house in Panchakula so that we could freshen up there and also had an Army Jawan, Gursatinder Bhai to help us in Chandigarh and was with us for the entire day. Post refueling our bikes, Gursatinder Bhai, Deb bhai, Rajesh and Gowda went to the Army guest house with all our baggage, while Harish Bhai, Phani, Karthik, K2 and I went to the nearby mechanic to get our bikes fixed. 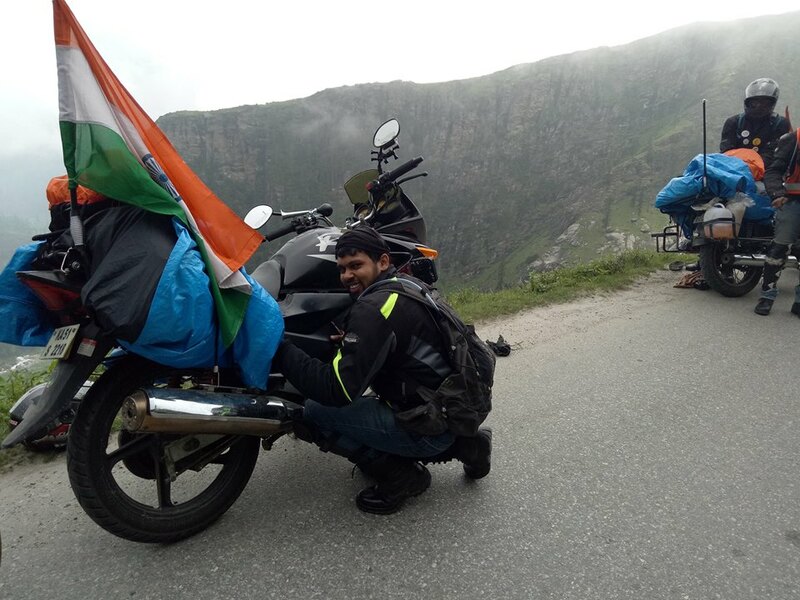 Harish Bhai and K2 got Ladakh carriers fixed to their bikes and all of us got flag rods mounted and rode till Panchkula, Army Guest House. The entire luggage was mounted on our respective bikes, greeting thanks to Gursatinder Bhai, we all kick-started the dream ride. Thanks a lot Satish Bhai and Gursatinder bhai for helping us at Chandigarh and Panchkula Guest House. 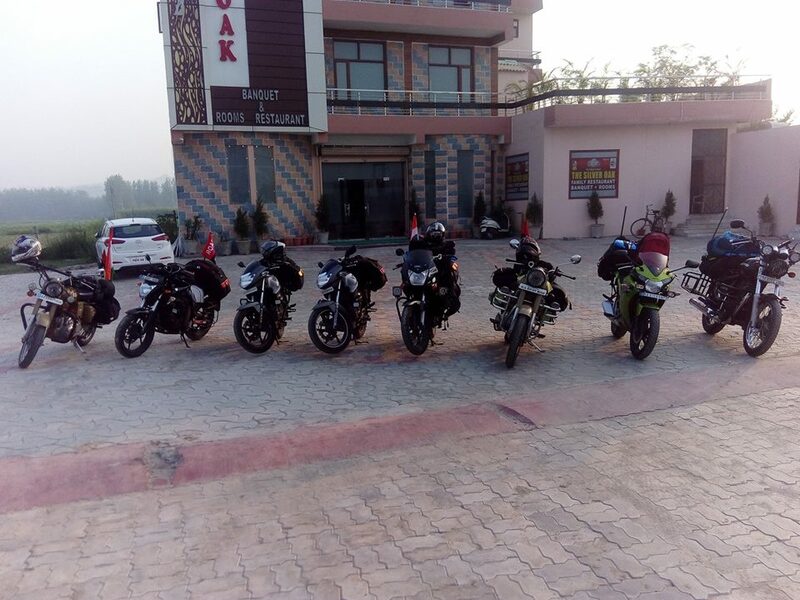 As we started late evening, we rode till Roopnagar and halted for a night’s stay at Hotel Silver Oak. The next day’s journey planning was being done over dinner. We all were ready by 6am and gathered for the ride briefing session and started our journey for the day. Riding for a few kilometres and we stopped over for breakfast at Saini Tourist Dhaba at the highway side. Post having some tasty aloo parathas, we continued our journey to Manali. At around 11am we reached Bilaspur where Satish Bhai joined us and that completed our pack of 9 riders. Just before the bridge across the Sutlej river enroute Mandi, I was hit with sunstroke. The extreme sunny temperature made me feel exhausted and that’s when I told Deb Bhai, “Bhai gaadi rukha de, warna mai tokh dunga kahi pe, I need some juice or glucose” (Bhai let’s stop for a juice, I am exhausted and would bang somewhere if I don’t stop over). Gowda, Deb Bhai and I stopped over at a road side sugar cane juice shop. Everybody thought I was hit with AMS (Acute Mountain Sickness). But I was sure that was not AMS. Ha ha ha…. The crazy me !!! We then rode till Mandi and stopped over for lunch at Hotel Shingar. Post a delicious lunch we started our journey to Manali. As we crossed the Pagodah Dam, The first tunnel came our way was “Aut Tunnel”. 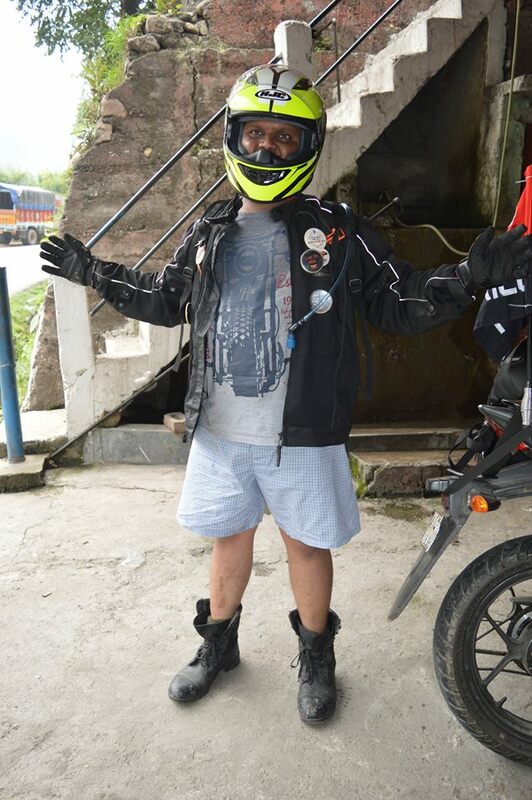 It was a nice experience riding through the 2nd longest tunnel in India with a length of 3kms. The only sound you can hear is the echoed sound of bike exhausts, especially the Dug Dug Dug Dug Dug sound of the Royal Enfields. Riding along the river Beas that flowed parallel along the highway and pine trees over those mountains was a blissful view. 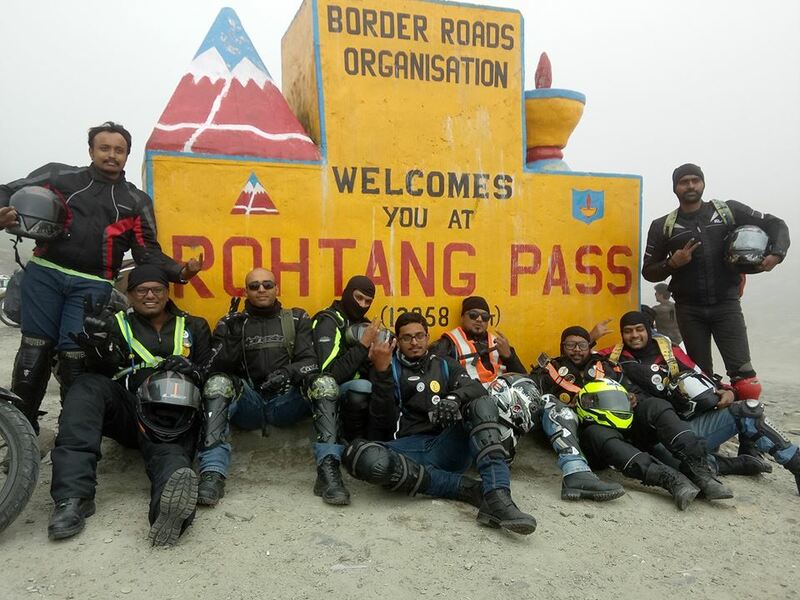 We stopped at Manali check-post to obtain the Green Tax which costs Rs100/- per bike and once we reached Manali, Rigzin Bhai assisted us to the home stay. Phani and I quickly got dinner parceled for all us from a nearby hotel and post dinner we all crashed into the beds. This ended our day 2, riding for 16 hours covering 280kms amidst heavy vehicular movement. This was the day where we start riding over those passes. Rohtang was the first pass that we had to conquer. 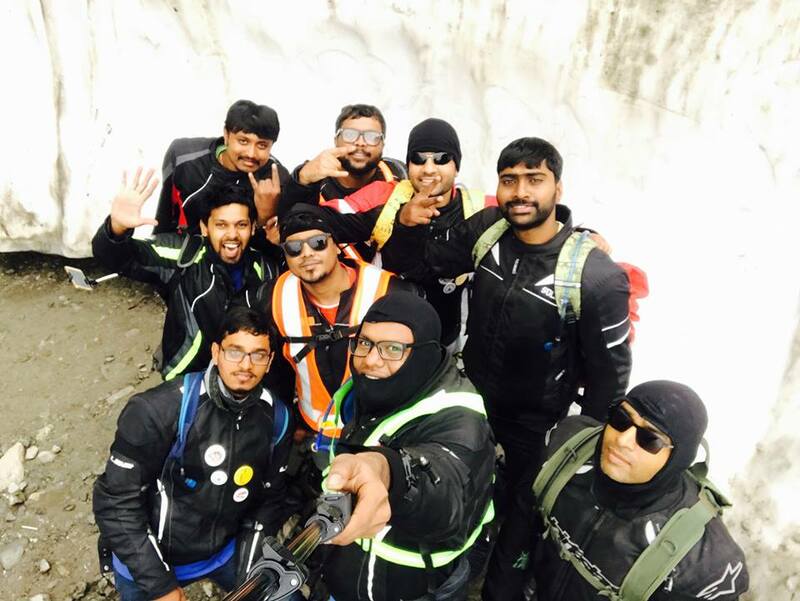 We all wanted to capture every moment of this journey; our cameras were fully charged and mounted on the bike’s handle bar and helmets. Bidding farewell to Rigzin bhai and refueling our bike full tank, we started on Manali – Leh Highway. 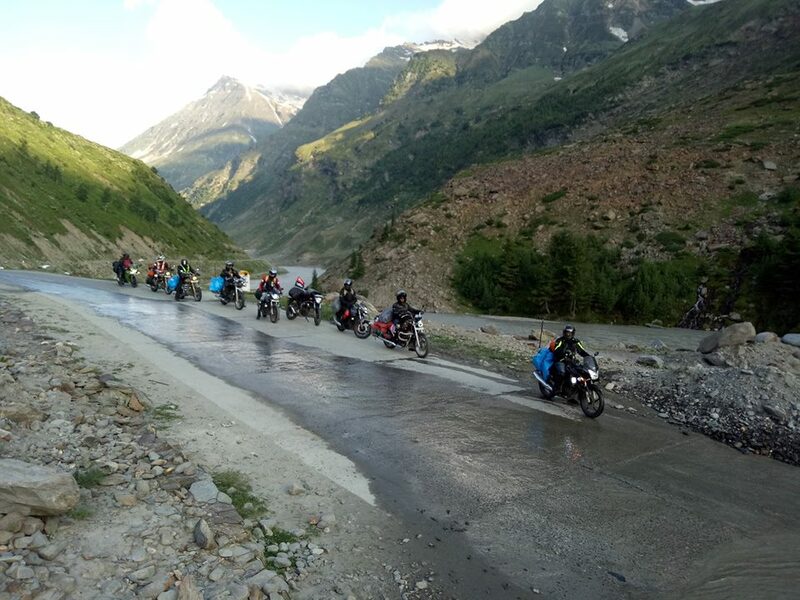 The first pass that we came across was Rohtang Pass. The peek fulfilled the promise of the view; it was an impressive sight, the shadow of the mountains that reached deep into the land. Riding uphill was a beautiful journey. Somewhere in the middle of Rohtang, Phani’s “Beast” was down with some ignition problem. Harish Bhai and I were signaling the traffic from either of the sides to slow down, while Deb bhai and K2 assisted Phani while he fixed his bike. 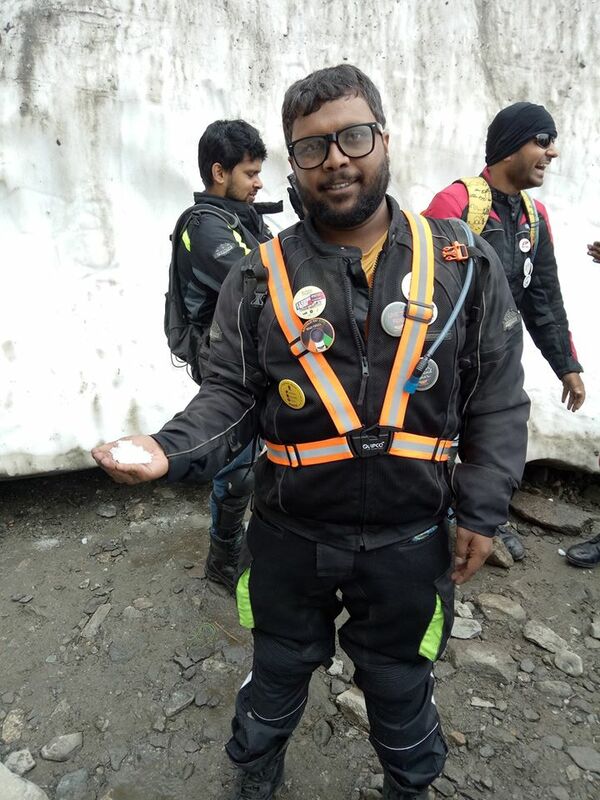 A quick stop over at Rani Nallah, where we could actually touch snow. That was the first time I ever saw snow in my life. Soon we reached Rohtang Peak and gathered near the Rohtang Pillar. 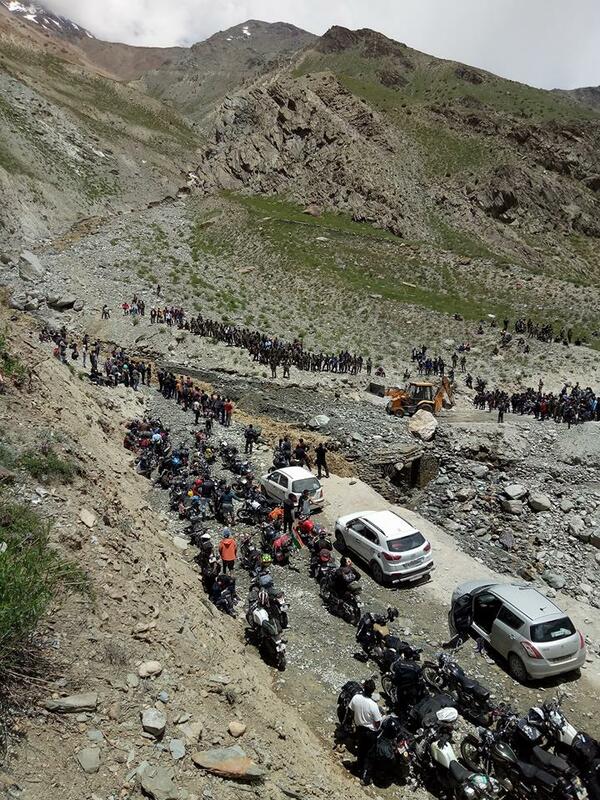 The next stretch of the roads from Rohtang to Koksar village was complete off-roader with few water stream crossing. 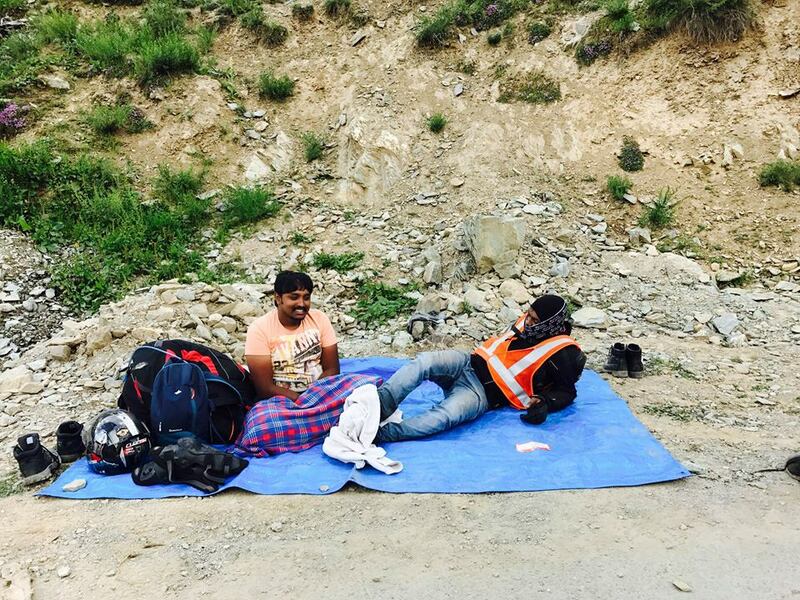 At Koksar Checkpost, we showed our Beyond Rohtang Permits to the security personnel and stopped over for lunch. The only food available was Maggie and Omlette. The landscape around Koksar bridge was beautiful. 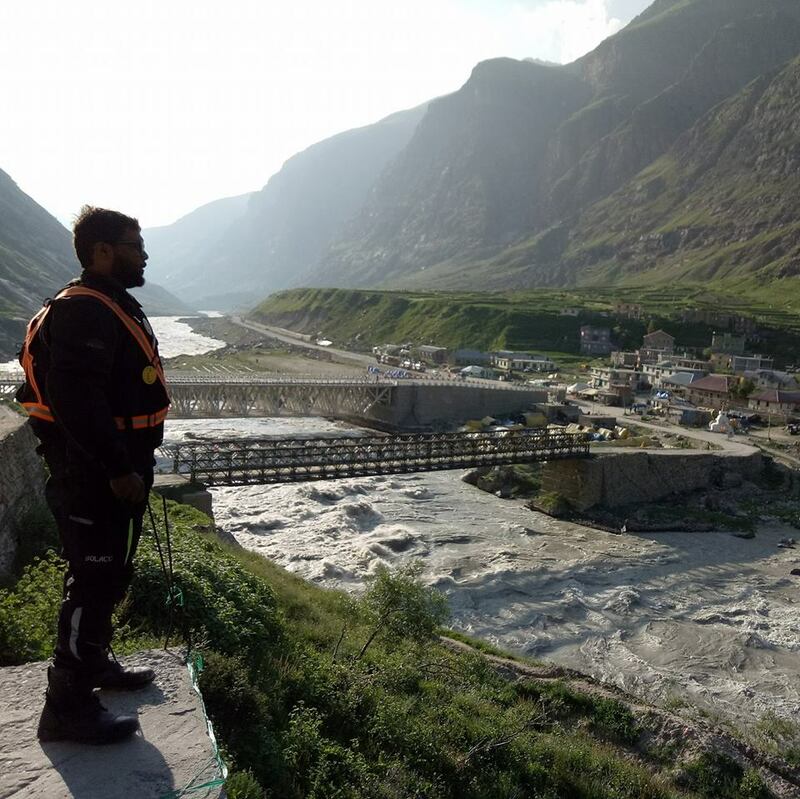 The river Chenab flowed parallel to the roads enroute to Sissu. Khoksar to Sissu had proper tarmacked roads with few of water crossings. I was fully enthralled riding at the dawn time watching those snow topped mountains. After some more stretch off-roading we reached Tandi. 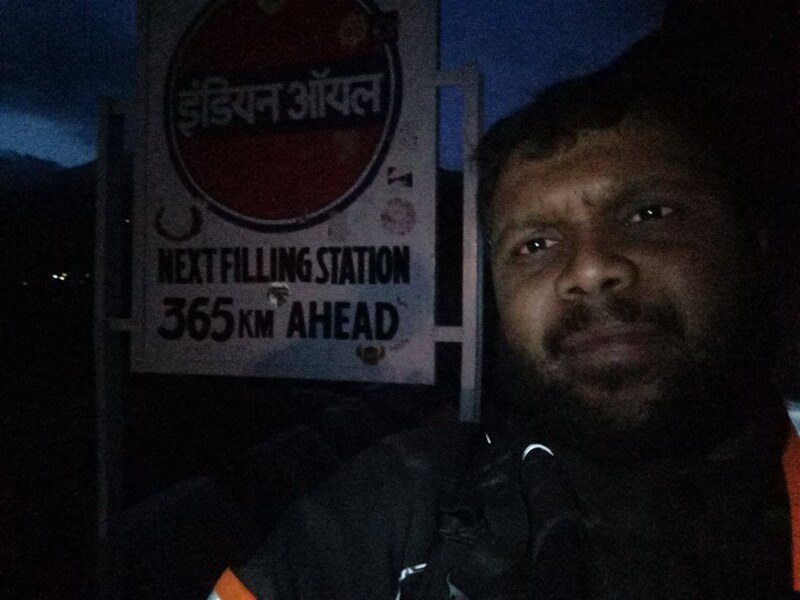 This was the last petrol pump on Leh – Manali Highway, The next petrol station was available after 365kms and we got our bike petrol tank full and stocked enough petrol in jerry cans that was required for the journey ahead. 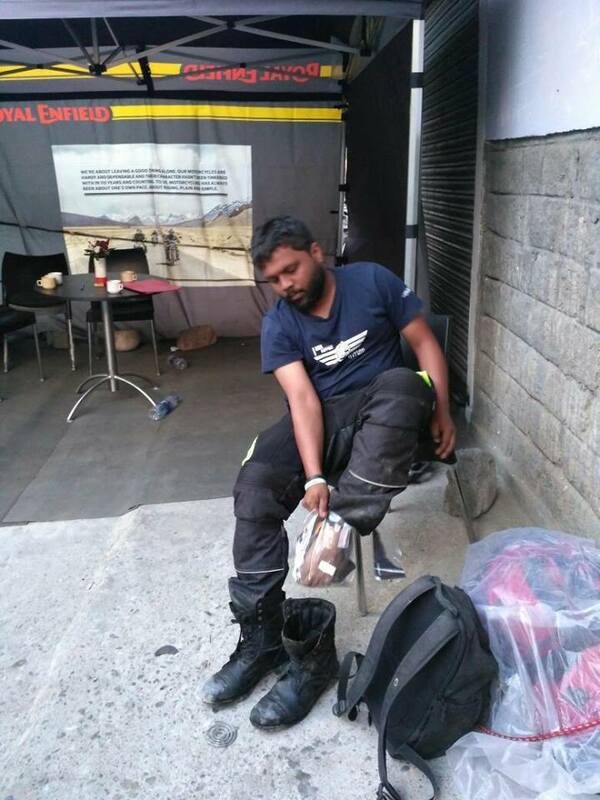 K2 sensed some problems with his bike’s clutch and gear shifting and we stopped at a Royal Enfield Service point while Rajesh wanted to top up his bike’s disk brake fluid. While K2 and Rajesh got their bikes checked, the rest of us rode till Keylong and started looking for a hotel for a night’s stay. We all checked into HPTDC Hotel and finished our dinner. Phani and I were interacting with few of the senior citizens and they recited the history of Keylong, as how tourism in this small town grew from years ago with so many travelers passing by through this town. We quickly planned for the next day’s journey and crashed to bed. I called home early morning to inform my parents that the next 2 days I won’t be under mobile coverage and assured them we all would be fine. Karthik was fixing his bike’s tire puncture while we all got geared up. Our next destination to halt for the day was Sarchu or Tso Moriri if we could ride till that further. 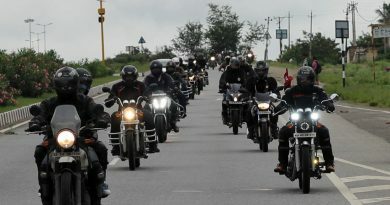 At Jispa we saw a huge group of Royal Enfield riding to Ladakh. 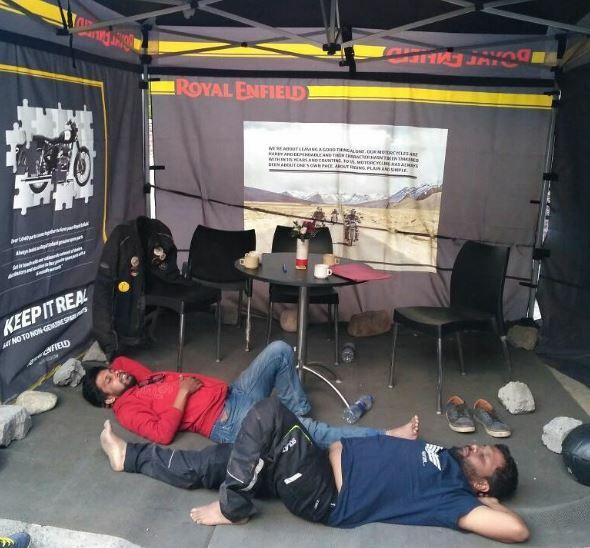 It was their Himalayan Odyssey to Ladakh. Somewhere near a village called Patsio, we had crazy water crossing and was a challenge to all the bikers. Every biker was to be assisted to cross this stream. It wasn’t easy to just cross the stream, bikers were to be pushed or pulled to cross this. Phani and I stepped into the water to help few fellow bikers and we were also helped by the fellow bikers to cross over. As all of the bikers crossed this stream, a local said there is yet another stream crossing just a couple of kilometers away, but as we reached there, it was not just a water crossing, it was a landslide. We along with 350+ bikes were stuck there. The Indian Army and Borders Road Organization were always to the rescue. The JCB drivers were trying their best to make a way through the landslide. The bikers grounded on the mountain side watching as the Army personnel worked to clear the landslide. We didn’t know how much time it would take to clear. 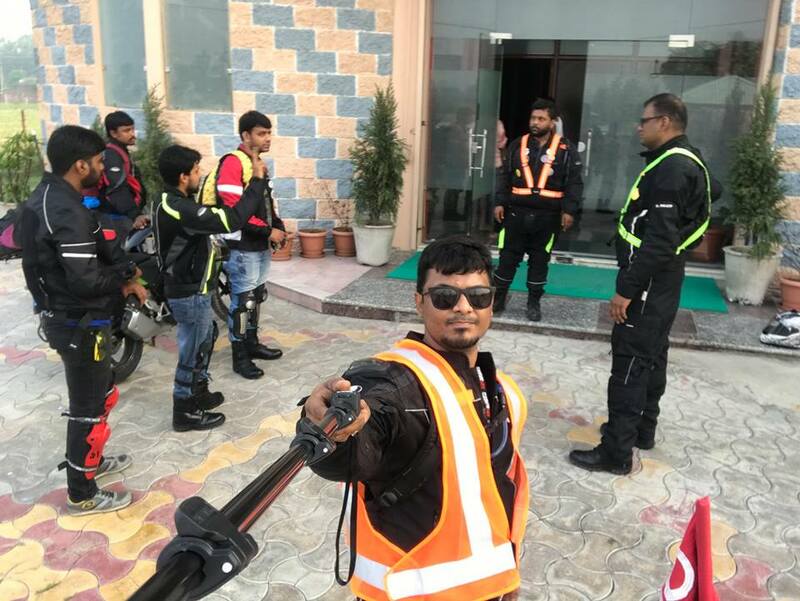 Amidst this, the Army announced that there was an emergency as one of a biker had to be taken to the nearest hospital and ordered all the bikers to make way so that the patient’s car could pass through. Many of the bikers volunteered to assist in clearing the way here. Phani and I volunteered too. Within minutes all the traffic was cleared on one side, so that the vehicle could move through the traffic. But it wasn’t as easy. A small bridge was collapsed due to landslide and the vehicle being stuck on the other side of the bridge. The Spirit of Biking Brotherhood was always held high. The Army somehow managed to pass on the stretcher across the bridge and was handed over to the bikers and each and every one of the bikers lent their shoulders in carrying the patient till the nearest SUV. After being stranded for 8 hours in the landslide area, it was finally cleared. A commendable job done by the Indian Army. As we rode amidst the chaotic traffic and crossed the water crossing, the clutch plates of Harish Bhai’s and K2’s bikes were burnt. We had extra clutch cables but not the clutch plates. Satish Bhai, Rajesh and Gowda moved ahead in the traffic. We asked each and every Royal Enfield bikers if they had spare clutch plates, but none had them. 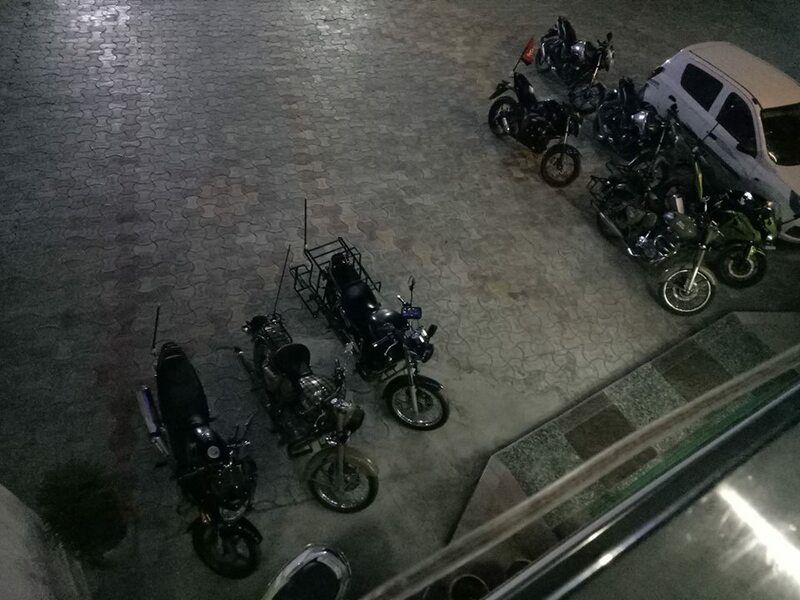 A Delhi based riding group had 1 set of clutch plates and had a mechanic along with them. We convinced the group head and he told their mechanic to replace the clutch plates of Harish Bhai’s bike. Once Harish Bhai’s bike got fixed, we sent Harish Bhai ahead to reach out to other 3 and convey the message of our bike breakdown. K2’s bike was still needs to be fixed. We couldn’t arrange for another set of clutch plates, we literally stopped each and every Bulletier asking for extra clutch plates, but none had. All other groups moved ahead, we were stuck in the middle of nowhere and completely out of cellular coverage. Phani and I decided to ride back to Jispa in search of Royal Enfield Service Station while K2, Karthik and Deb Bhai waited there. We both rode back again through that crazy water crossing, we had no one to help us this time to cross this stream. We somehow dodged through the stream and reached Jispa which took us more than an hour to reach the service station. The mechanics agreed to come along with us and fix our bikes as soon they finish off with the bikes they had in their garage. In the meantime, we parceled some chapathi and dal for us. As we waited in hunger the whole day long without food and water. We got some plastic bags in the garage. Those bags were of bike spare parts. It was a “jugaad” idea of wearing those plastics as a substitute to socks, we had no option here as we knew the water will be colder during late evenings. I handed over my bike to Ajay bhai and Santosh bhai (mechanics from Royal Enfield) and I hopped as pillion with Phani. As we crossed a small place Darcha, I realized that my riding gloves were fallen somewhere while I sat as pillion. Phani rode back alone for a few kilometers and came back with my riding gloves. Untill we reached the crazy water crossing, it was complete dark. A local tempo came there and we asked the mechanics to get into the vehicle and reach our boys and start repairing K2’s bike. It was again only we both to dodge the water stream. The water levels was high now, we both pushed each of our bikes one at a time to cross it over. As I parked my bike and came back to help Phani walk through the stream, he lost balance and fell in the water, I held his hand and pulled him out of the stream and then rode till we reached the place where the rest of us were waiting for us. Until we reached, the mechanics had already started to work on K2’s bike. The mechanics repairing K2’s bike under mobile torchlight. Meanwhile we were discussing on where to halt for the night, all the 5 of us riding back to Jispa was dangerous riding through those water crossing all over again. But by then, Karthik informed us that Deb bhai had already gone in search of tents towards Zing Zing. But the mechanics had to go back to Jispa. After a while, we stopped a Tata Sumo that was traveling towards Jispa and requested them to drop the mechanics back. 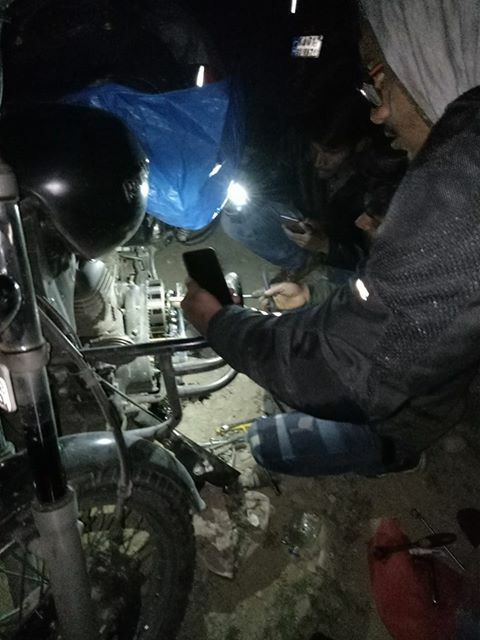 They said: “Bhai tum chinta math karo, aapka bike theek hone tak hum log aapke saath rahenge, chahe jitna be waqt ho jaaye” (Bhai you guys don’t worry, we will wait along with you until your bike is being repaired, no matter how much ever time it would take). Their words put me in tears. We badly wanted help as we were stuck amidst the mountains and the locals kept their words and accompanied us in that bare minimal temperature. As the conversations we had with the mechanics, we found out that it was one of the mechanic Santosh Bhai’s birthday, and he said, bhai mera birthday hai aaj aur maine apne ghar waalon ke saath baat bhi nahi kiya, phone network nahi tha (It’s my birthday today and I haven’t spoken at home as there was some phone network issues). Meanwhile, Deb bhai was back after arranging for tents in Upper Zing Zing Bar and we decided to celebrate Santosh Bhai’s birthday, we didn’t have any cake or sweets, his birthday was celebrated with the chapathi’s that we parceled from Jispa. Please click on the below link to watch Santosh Bhai’s birthday celebration. Very heartfelt thanks to the mechanics and the locals who stood by us during the bike being repaired. Deb bhai was accompanied by the Tent stay owner in his Tata Sumo. All our baggage was dumped in the vehicle and we started riding till upper Zing Zing bar. We were riding at minus degree temperature and in total darkness. I was completely drenched and shivering. At a river crossing, I rode over a stone, I actually jumped off the stone, and until I realized what went wrong, I was near the edge, but somehow managed to control my bike. Had I not controlled my bike, I would have jumped of the mountain and would have been in pieces. Phani was behind me, and asked “Are you fine and will you be able to ride” and I said, yes bro I am fine, lets reach the tents, we quickly need a shelter. We reached the tents at upper zing zing bar and got myself warm with some hot tea and Maggie and slept over. I woke up late in the morning to realize I was down with fever and body pain. I could only see things being faded away; I wasn’t even in the position to stand on my feet. Whatever my team spoke, bounced over me. I couldn’t even breathe properly. 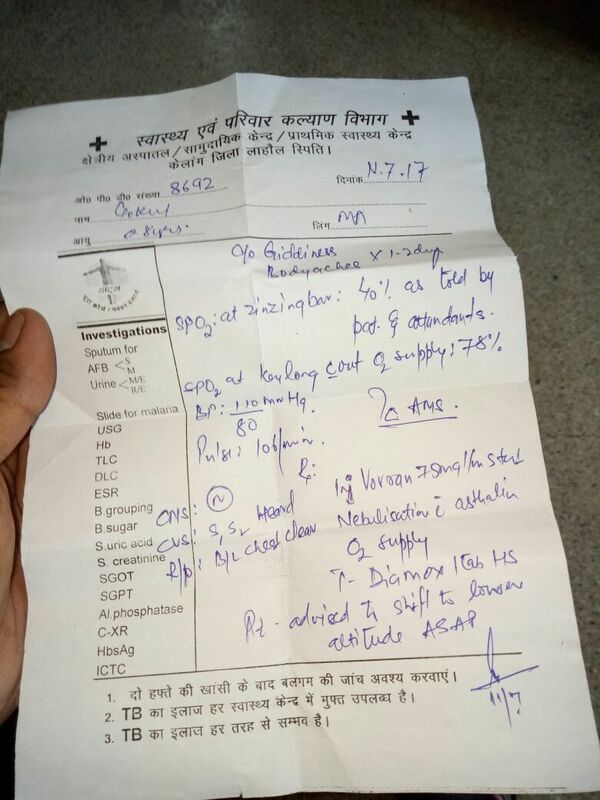 All the medicines that we purchased were with Rajesh and we couldn’t connect with them. Another biker group that stopped over at Zing Zing gave me an oxygen cylinder that helped me breathe. Phani, Karthik and K2 took me to the nearest Army Hospital for check-up. 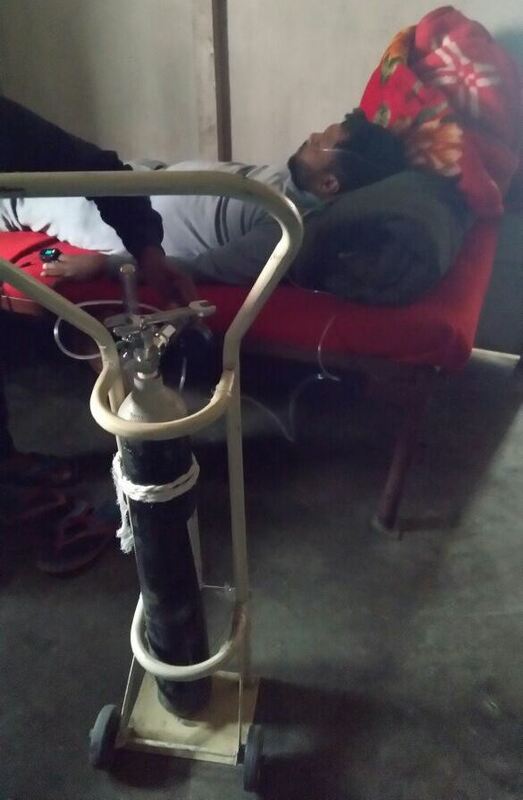 The doctor there told my oxygen was below the levels of 40 and I should be immediately taken to Keylong Hospital. I was hit by AMS (Acute Mountain Sickness). 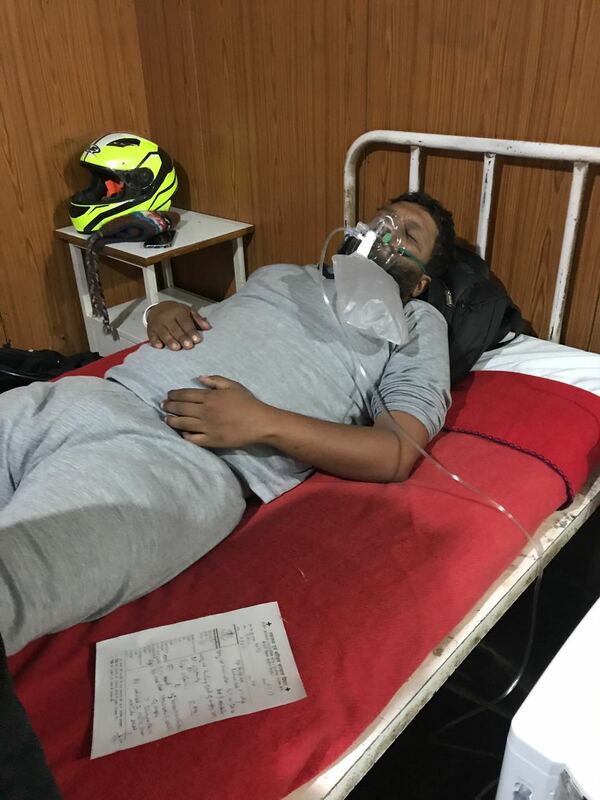 The army doctor also told, it would be the risk of my life if I ride further with this bad health. I was dumb struck. Phani, Karthik, K2 and Deb bhai had a tough time convincing me that my Leh Ladakh Bike Trip dreams was about to end. I had no option but to head back to Keylong Hospital. A Truck was arranged to cargo my bike till Keylong and I was accompanied with Phani and K2 in the truck. The journey from Zing Zing to Keylong was in the truck and I was taken to the Government Hospital, Keylong. I was numb hearing to the Doctor, I lay down at the hospital with the oxygen mask on my nose and the nurses injecting me. Phani and K2 booked a lodge nearby and shifted me there for the night’s stay. K2 informed Rigzin Bhai about my health conditions and Rigzin bhai agreed to come to Keylong the next immediate day and take me back to Manali. Phani and K2 boarded the early morning bus to Zing Zing. Rigzing bhai and his friend rode to Keylong to take me back to Manali. As they reached to Keylong, I handed over my bike keys to Rigzin Bhai and I hopped into a taxi and slept off and requested the taxi driver to wake me as we reached Manali while Rigzin bhai and his friend rode till Manali. Rigzin bhai and his family took great care of me at Manali. Post having dinner at Rigzin bhai’s home I crashed to bed. I woke up late in the afternoon and somehow rode to Manali city and booked a Volvo bus that would take me and my bike to Delhi. 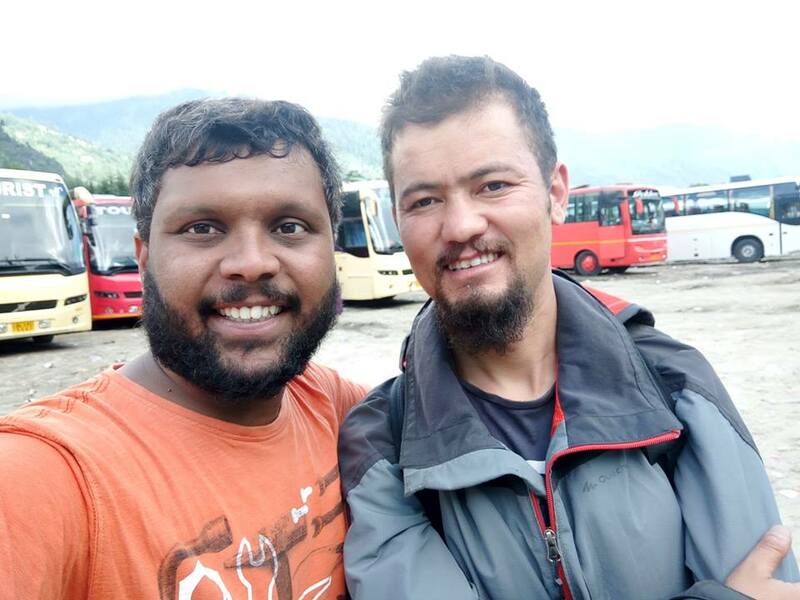 Rigzin bhai helped me to load my bike in the luggage compartment of the bus and I boarded the same bus to Delhi. Before our journey began, I had never met Rigzin bhai; we only interacted on Facebook and over phone. 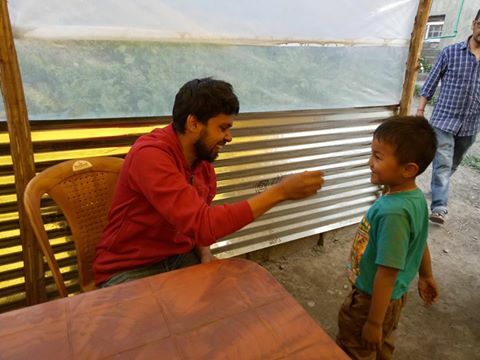 Rigzin bhai helped us a lot from the requirements of Inner Line Permits to getting home stay booked at Manali and even during my bad health issues from Keylong to Manali. A heartfelt thanks to you brother. Hopefully I shall do the Leh Ladakh Bike Trip with you, next time ! ! As I boarded the bus, I informed JP Bhai from Road Thrill that I will be reaching Delhi the next day and might need some help. JP bhai immediately connected me to our Road Thrill chapter in Delhi. I was at Delhi the early morning. I got down at the last stop at Delhi and unloaded my bike from the bus and got in touch with Harsh Bhai who moderates Road Thrill Delhi. My bike’s fuel tank was dried over and tire pressure reduced while loading my bike into the bus. I couldn’t find any hotels in the nearby vicinity and I slept over in the bus until Harsh Bhai reached the place. The Volvo bus drivers were friendly enough and told me “Tumhara dost aane tak, gaad mei hi so jao, gaadi shaam tak yahi rahegi” (You can sleep in the bus until your friend reaches, the bus will be parked here till the evening). I walked to a nearby juice cart and ordered for Mosambi juice saying Bhai 10-15 glass juice bana do. I was exhausted and hungry and wanted something to replenish my hunger. Harsh bhai drove till the place where I was grounded, I quickly dumped my luggage into his car and we drove to the nearest petrol pump and got some fuel for my bike. I then rode following Harsh bhai to his home. I got myself freshened up here and we went to a nearby hotel for Brunch. 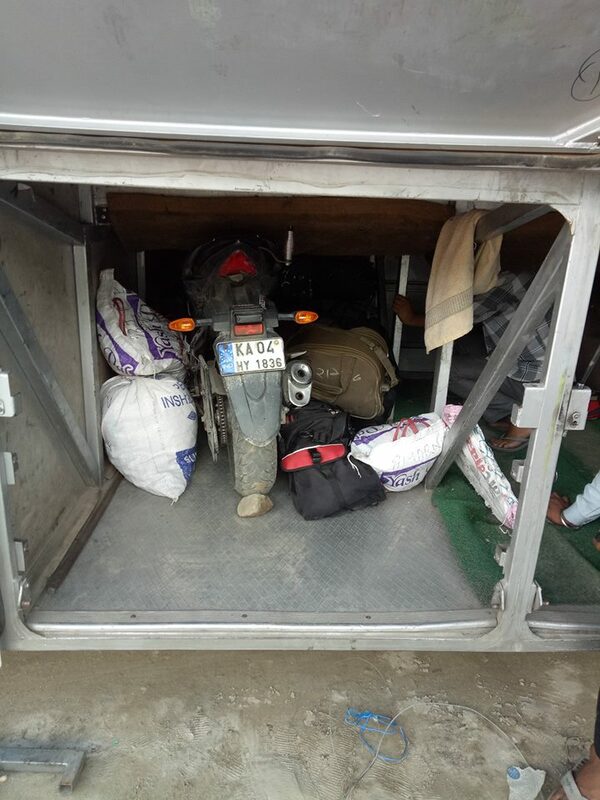 I got in touch with a transport carrier through Varun Bhai and they agreed to send their representative to pick my bike and then transport it to Bangalore. The whole day I was with Harsh bhai, we had a good time discussing about my Leh Ladakh Bike Trip and the rides we have in RT Chapters. I handed over my bike along with the keys and the necessary copies of the documents to the representative of the Transport Carrier Company. My bike was cargoed in a Truck from Delhi to Bangalore. My friend Punit immediately booked my air tickets for my travel from Delhi to Bangalore. Thanks a lot Harsh Bhai for the help in Delhi. I got a cab booked to Delhi Airport, my flight was to be departed at 10.30pm but was delayed by 2 hours. Upon reaching my room in Bangalore, I was totally lost. The memories of the entire journey were flashing in-front of my eyes. I took a day rest and decided to travel back home to Belgaum. I boarded my bus to Belgaum, I was nowhere but staring at the Moon through the window pane. My childhood dream was unfinished. All the efforts that were put behind dropped as tears. 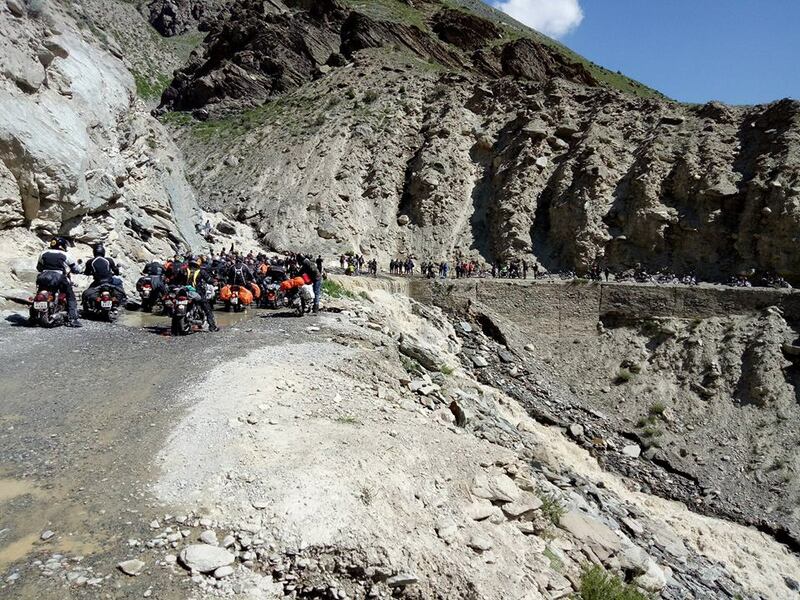 Every biker’s dream is to do the Leh Ladakh Bike Trip, a pending dream for many bikers, only few attempt it, a very few accomplish it, while a few fail. I failed in my very first attempt of riding my Dream ride. 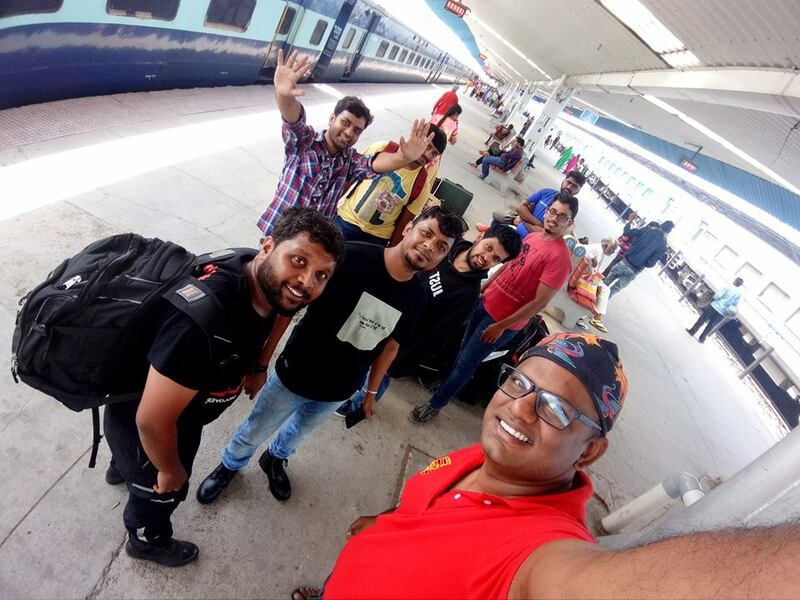 I was so near but yet so far . . . . . .
My bike was delivered to Bangalore on 25th of July, 2017, the same day, Phani, Karthik, Gowda and Rajesh’s bike reached Bangalore City Railway Station. Once I received my bike, I went to Bangalore Railway Station along with Phani to collect their bikes. 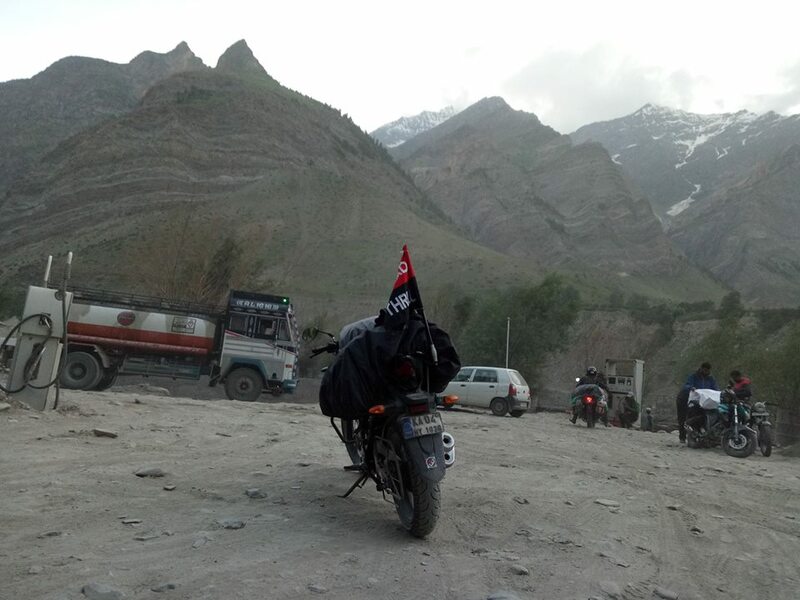 I am blogging this from the memories of my unfinished journey of the Leh Ladakh Bike Trip. The memories were worth all the money spent and the risk taken. I was told by my Dad that I was blabbering during my sleep, “Has my Leh team crossed Srinagar” those were the words I spoke while asleep. Out of the planned 2650 kms I could only ride for 700 odd kms. Thanks a lot to everyone who supported me throughout the journey, thanks a lot one and all from my Leh Ladakh Bike Trip Team. A very special kudos and thanks to Phani, K2, Karthik, Deb Bhai, Rigzin Bhai, our Road Thrill family members (JP Bhai, Harsh Bhai and Varun Bhai), DK Pandit Sir and last but not the least the mechanics Santosh Bhai and Ajay Bhai from Royal Enfield Jispa and also the contractors who stood by us near Patsio. 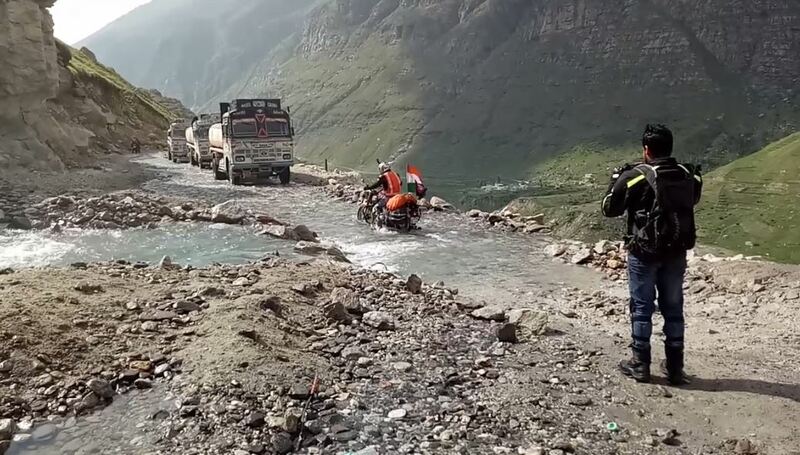 A proud moment of respect to the Indian Army, Borders Road Organization and the fellow bikers during the emergency situation at the landslide area. 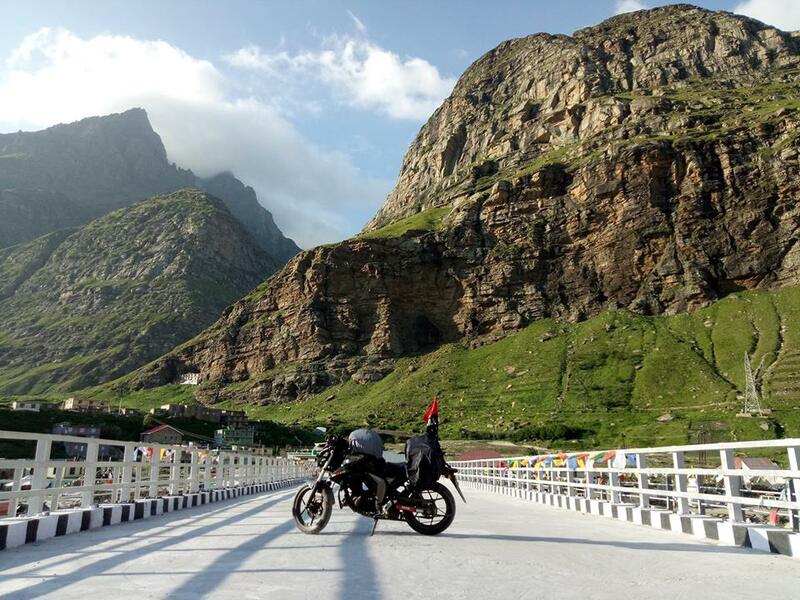 These were my experiences from my journey to Leh and a promise I keep to myself: “I will definitely complete the Leh Ladakh Bike Trip Circuit for sure in my life hopefully 2018”.